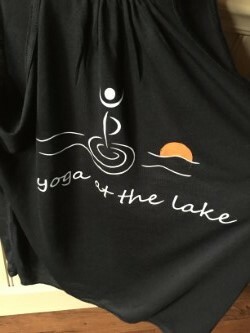 yoga at the lake is a rural studio offering a variety of yoga and fitness classes as well as retreats and other special events at the Village at Pigeon Lake all year round! It all started back in 2013 when I burned out. Yes, surprisingly it happens a lot in the yoga world. Especially when running a business & teaching & not knowing if keeping a business going is the right decision. Sometimes the things we teach are guided by what we have already gone through...with the hopes that sharing our stories of struggle can help prevent others from going through the same darkness. To see all the classes running, please see the pending schedule below. There will be no class on Thursday August 30 @ 6:15pm or Friday September 1 @ 5:15pm. If you register by August 31, you receive $5 off any session pass for fitness classes! I have handed out studio key tags that offer a discount to our fellow village businesses. If you need more or did not get one, please let us know. I am extending the tags to be used through September & October. During our pre-registration, which is on now from August 15-August 31, we only need pre-registration for NEW classes so we know there is enough interest to run the class. With your help we know which new classes to keep on the schedule! The finalized schedule will be sent out on August 31! Session Passes: If you decide on a session pass, it will cover you through the entire session. You can switch it up every week if you want to try out or need a different class. If you miss a class one week, you can make it up within the session. Of course, we also have our punch pass or drop in options for those with unknown schedules! Registration is now open! Please email me to register or sign up at the studio! I will be ordering some yoga props & therapy balls. Please confirm if you would like a set of therapy balls & I will order them for you! They are $30. For yoga props please go to www.shophalfmoon.com & let me know which items you would like. If we place an order over $200, we get free shipping! I need to know the items you wish to purchase by September 10. If there is interest, we will line up times for you to use the equipment on your own. New to yoga? Please join us for this beginner class! Learn safe alignment for your body and how to use the breath to assist you on and off your yoga mat. Variations/modifications will be given where needed to customize your practice to suit you. Yin Yoga & Essential Oils on Thursdays @ 6pm: NEW TIME!! Yin Yoga is a slow-paced style of yoga with postures that are held for longer periods of time—for beginners, it may range from 45 seconds to two minutes; more advanced practitioners may stay in one posture for five minutes or more. Yin yoga poses move gently into the connective tissues of the body—the tendons, fascia, and ligaments—with the aim of increasing circulation in the joints and improving flexibility. A more meditative approach to yoga, yin aims at cultivating awareness of inner silence and allows students to calm their nervous system down. This class will include the use of therapy balls. Therapy balls provide targeted self massage trigger point therapy by using specially designed high grip rubber balls and focused movement routines that help penetrate through layers of skin & muscle to massage deeply into your high tension areas. In addition, we will be using yoga poses that will assist in relaxation and decreasing muscle tension at the end of your work week. Rise & shine...it's yoga time! What a way to start the day! Take time for self care first thing in the morning. Gently wake up your body with your morning yoga practice including sun salutations for building strength & endurance and poses for balance and flexibility to support the health of your joints. This class is designed to rinse and rejuvenate the body and get it ready for the day ahead, giving you more energy throughout the day! In this class, improve your stamina & endurance while you hold yoga poses and add dynamic movement with small weights to some of the poses. Dynamic movement with a little extra weight will challenge you in different ways! Also, adding weights can increase lean body mass which helps to support your joints, burn more energy throughout the day and increase bone density. This well balanced class combines fun cardio moves with functional exercises designed to keep us mobile in our daily activities. Suitable for all fitness levels. This class will teach you basic alignment and correct form for lifting free weights. There will be a different focus each class on working specific muscle groups (back & biceps, legs, etc). Looking or a fitness class that will challenge you in new ways? You've found it! Utilizing the TRX suspension training system and strength training, you will be challenged with a mixture of cardio and resistance training. This class is suitable for all fitness levels from beginner to advanced. Low impact options are available for those with injuries and other limitations. With this high intensity interval training class, 45 minutes is all you will need to get in an efficient workout. Interval training helps to challenge and improve your cardiovascular health & increase your metabolism & energy long after you have left the class. HIIT uses a system of work-hard-then-recovery intervals, alternating between high intensity workouts with short resting periods. This class is suitable for all fitness levels from beginner to advanced. Low impact options are available for those with injuries and other limitations. Not having time will no longer be an issue with this quick 30 minute class. Rinse out the tension developed from your work day & work week. Let some stress go and get your workout in during your lunch break. This class is time for you so you can revitalize your body & mind, helping to improve circulation & oxygenating your body and mind for a more focused afternoon! This class is suitable for all fitness levels from beginner to advanced. Low impact options are available for those with injuries and other limitations. Cost: $112. Register before August 31 $108. Includes class & mat rentals for everyone! In these classes, children will practice a variety of yoga poses to help them develop strength of mind and body. Weekly classes are thematically based incorporating stories, music and games. Please register by September 5! Take time for self care. Build strength. Improve flexibility & joint health. Increase bone density. Decrease pain. Improve cardiovascular health. Experience what a consistent yoga practice & fitness regime will do for you! Challenger board will be provided to track your progress. Prizes and pass discounts from our local businesses for top 3 highest attendance! Challenger gift bag full of support! $30/night per person (based on 4 person shared occupancy in beautiful new insulated pine cabins set in the woods). One hammock per cabin included for relaxing. "Basic Steps to Support Overall Health"
Please email me to reserve your spot as space is limited! Jackie Yurko BSc, ND will be coming out from Edmonton for a free information session on Naturopathic Medicine. She will cover the basic steps to support overall, holistic health. Topics covered at this information session can be easily integrated - learning about the benefits of a healthy whole foods diet, essential fatty acids, vitamin D, probiotics, multivitamin & B complex. She will also cover heart health & the importance of specific supplements for your heart muscle like ubiquinol and co enzyme Q10 and the difference between the two. There will be a question & answer period at the end of the session. This workshop will cover what trauma sensitive yoga is & how it can help support those who have experienced trauma. We will then be guided through a trauma sensitive yoga class so you can experience the differences & unique energy of this type of class. If you wish to use the fitness studio equipment on your own, please let us know. Enjoy a guided meditation each week focused on gratitude. Gratitude can shift perspective and can help us stay positive especially when we are dealing with difficult situations. What you focus on expands. So take some time to relax & unwind and notice the effects this session has on your body and mind. Create your own natural products using Health Canada approved therapeutic grade essential oils. The items below are studio favourites! Prevention & protection is key! Help support your immune system! We supply all the products, essential oils & containers. Friday September 15 @ 6:30pm OR Saturday September 16 @ 12pm. Please register as space is limited. Bring your old container/rollers to refill & get $1off for each one! Check out our new yoga at the lake tanks! What oils resonate with you? What colours are you drawn to? What part of your body do you hold the most tension? These are all great questions to guide you toward what bracelet would best support you. You choose your bracelet, your colours & your oil. These bracelets also have lava beads which are used for essential oils so once you choose your oil you will receive that oil sample that can be used numerous times with your bracelet. Cost: $50 (includes chakra write up, bracelet, oil sample & bracelet bag) OR $40 for just the bracelet. Private Aroma Yoga Classes: A blend of yoga poses, essential oils & energy exercises for your body, mind & spirit. Essential Oil Events: Host your own Make & Take at the studio with Health Canada approved therapeutic grade essential oils! With burnout, the immune system shuts down & blood sugar is out of balance. My heart was beating irregularly. I was so worn down that I developed an inner ear infection that made it impossible to teach. I had to use a wall to hold myself up because of how wavy I was. It would hit me randomly and my heart rate would skyrocket and beat really fast for around 20-30 sec. Then I would feel even more wavy, all while I was teaching which made it worse because I didn't know if I would make it through the class for the students. I felt like I was on a boat rocking back and forth. I ended up being bed ridden for a month. I was in the midst of moving the studio to the location we are in now but I did not know if I should close the studio or not because of how I continued to feel. My MD said fluid in your ears clears at 6 weeks so I went to the audiology clinic at that 6 week mark. All was normal. I went to a Vestibular Therapist to make sure my wavy symptoms were not some sort of vertigo. All was normal. I had an MRI & a CT scan done to make sure nothing structurally was going on. All normal. I had a heart ultrasound done which was normal. I was so happy that everything was ok but the unknown symptoms were still there so this was also a worry. I went to other forms of treatment. I went to a chiropractor that verbally attacked me to the point where I just broke down. She told me I could heal myself and that there was nothing wrong with me. And that I should close down my business. I absolutely believe in the power of the mind on the body. If I can cause myself anxiety with the way I think and elevate my body systems... I know I can do the opposite and do my own healing and send that healing into my body with my mind. I know our cells respond to our thoughts and my brain is more powerful than I give it credit for..but the way she handled herself that day was horrible...and especially coming from someone who is supposed to be a "healer". I felt she shamed me for trying to find a solution. Hey, I am ok with a little tough love...especially if I am continuing to complain about something but not making any changes to do something about it. But when I am dealing with months of debilitating symptoms & exhausting all efforts to find help and I am put down for it...that is when I say goodbye. After that experience, I ended up finding a chiropractor that supported my path to healing. My symptoms went on for 4 years. One thing I have learned is I have to be an advocate for my own health. I have to make the system work for me. It wasn't easy to stand up for myself when I felt so awful. But I couldn't just take what the medical system was telling me..that all was normal, when I still felt so terrible. Thank goodness I had an MD who worked with my Naturopathic Doctor. This support of medical and natural approaches working together needs to happen more. I think patients would be navigated so much better because the 2 systems are working together. And dealing not just with symptom relief but finding the underlying CAUSE of a health issue. There is a place for both systems and both can help. I feel they would be stronger together. Throughout all of this I was saved by other instructors who taught for me so I could keep the studio going. I was supported by the students in every possible way. And my mom, Jonathan my partner, & my friends & family helped me keep the studio going. But I had to ask myself the question again, do I keep the studio open? Are the hard times just before some relief? I come back to the word SIMPLIFY. And also LOVE. And to hear all the love and support before and after classes brings tears to my eyes and has been all the reassurance I need. I love seeing the bonds & friendships created! That the studio has become a solid ground, a sanctuary of support for those struggling with so many things. And also, there is celebrating together. JOY! The giggles and laughs we have together lift my heart. And what a team we have! A beautiful group of ladies here to support one another and the students. Just this last winter, I had another message that something still wasn't balanced. I was just about to head out to the lake & before I packed up the car, I ended up with weakness in both my arms so I called Jon and he took me to emergency. I thought, am I having a heart attack? At emergency, all was normal, yet again. So I booked an appointment with my ND. She has been with me & supported me through so many years and I first met her when I had to get 5 thyroid needle biopsies back in 2010. I have been a bit of a puzzle to my endocrinologist because I have a multi-nodule goitre yet all my thyroid levels are "normal" in the lab results. He said I didn't t need to follow up for 5 years. So I took a copy of my lab results to my ND (and what a relief to have someone look over ALL my numbers WITH me and know how to determine if something was off). My TSH was .67 which is considered "within the normal range" BUT I was still having wired tired feelings, needing tons of rest & was still wavy and now the weakness. Even though I eat well & A LOT!..I needed Vit D & iron (Vit D can really influence mood & through our winter months we never get enough of it & it's something that is needed DAILY). Food isn't as nutrient dense as it used to be so supplementing is so important for me. And it was so interesting to also have a live blood analysis done because it showed that I had low iron as my cells weren't glowing (like they are supposed to when you have enough iron). After being on my liquid iron supplement for 6 weeks, I had another live blood analysis done and my cells were glowing! So cool to see your cells up close. So alive. So beautiful! We are what we eat so our bodies reflect and are made up of what we put into it...so as far as lifestyle changes, my ND suggested getting off coffee (which is a fake stimulation for my metabolism) so I did it! I have decaf now. I thought there would be no way I could have NO coffee seeing as I started having it back in university! But by going off it, I realized it was the flavour not the caffeine that I liked. And I still get a little boost from the decaf but it is so much easier on my thyroid & blood sugar. My ND also got me on a thyroid support. And within 3 weeks my TSH went from .67 to .99 and my waves dissipated (when your TSH starts to go down, it means you are getting close to being hyperthyroid). One of my books called Thyroid Balance has a chapter in it about how lab results can be normal but a person can still be feeling off so that helped me to not feel so alone on my journey to find a solution. I am the one living in my body so I KNOW when I am still not feeling well. My yoga practice became a crucial part of my healing through this whole process. I used stillness and movement as my medicine. My practice changed to suit what my body needed. I went from 12 years of practicing mostly in the heat to restorative & yin yoga and active practices but out of the heat because that is what my nervous system needed. Now that I am feeling better, I do go to warm practices when my body calls for it. I just listen to what my body needs, moment to moment. When I was sick, sometimes a practice would consist of a couple poses and then savasana. Now, I check in daily to see what my body needs. Yin yoga today. Warm flow maybe tomorrow but I stay in the moment & decide. Yoga has helped me listen clearly to the honest communication my body gives me. Please know if you are going through struggles that you don't have to go through it alone. And please know that with yoga, it is about consistently moving your body in intentional ways & with full awareness of every move that can help support your healing. Movement as medicine. Movement as a way to rinse trauma out of our bodies. Every day is different. Every practice is different. Preventative maintenance of our health is so much easier than having the alternative. The amount of time it takes to recover. The amount of struggle & suffering. And sometimes we don't ever fully recover. So I take time every day to give back to my earth suit that takes such great care of me. It deserves attention & love. A great analogy is how we take care of our vehicles. Maintenance of our cars is necessary so they don't break down. If we leave our vehicles for too long, things don't work as efficiently. Same goes for our body. So that is why I bend now. I move now. So I can take care of the precious gift that has been given to me. Sometimes the only way we make it through things is by being vulnerable enough to share our stories & to reach out and let others help us up when we have fallen down. In vulnerability, there is so much strength & beauty. And you just never know whose life you will impact. How your story may change or even save a life. So if you reach out & you need support, I will be here. We will be here for you.